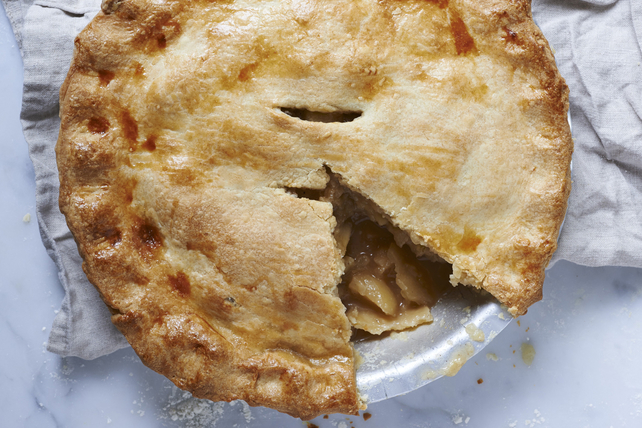 The name says it all in this apple pie recipe. This truly is The Perfect Apple Pie - we'll show you how to make a tender crust and a luscious apple filling. Preheat oven to 400°F. Mix flour and salt in large bowl. Cut in shortening with pastry blender or 2 knives until mixture resembles coarse crumbs. Add water, 1 Tbsp. at a time, mixing lightly with fork until flour mixture is evenly moistened and clings together when pressed into a ball. Divide dough in half; shape each into 1/2 in. thick round. Wrap each dough round in plastic wrap; refrigerate 10 to 15 min. Meanwhile, toss apples with sugar, corn starch, cinnamon, nutmeg and lemon juice in large bowl; set aside. Place 1 dough round between 2 large sheets of plastic wrap; roll out dough with rolling pin to flatten slightly, working from centre of dough to the edge. Turn over; continue rolling until dough round is about 2 in. larger than diameter of inverted 9-in. pie plate. Peel off top piece of plastic wrap; invert dough into pie plate. Peel off remaining piece of plastic wrap: press dough evenly onto bottom and up side of pie plate, being careful not to stretch the dough. Trim any excess dough hanging over edge of pie plate with sharp knife or kitchen scissors; reserve trimmings. Fill with apple mixture; set aside. Roll out remaining dough as directed; place over filling. Trim top crust about 1/2 in. beyond edge of pie plate. Fold edge of top crust under edge of bottom crust; pinch edges together to form a ridge. Flute edge. Cut several slits near centre of pie to allow steam to escape. Bake 45 to 50 min. or until juices form bubbles that burst slowly. Cool. This is an indulgent dessert to enjoy once in a while. Watch serving size. What a great tasting pie! It is just like the one my grandmother used to make. A pie with a slice missing sitting on a cooling rack near a window. Top each serving with 2 Tbsp. thawed COOL WHIP Whipped Topping or a slice of KRAFT Cheddar Cheese or CRACKER BARREL Cheddar Cheese. Flute (to finish) edge by using 2 fingers to press a V-shape into the crust edge. This will look like a wave or ruffle design when finished. Or, pinch and slightly twist the pastry as you move around the pie to create a rope design. Prepare apple filling as directed, substituting 2 Tbsp. uncooked MINUTE Tapioca for the corn starch. Let stand 15 min. in bowl, then mix lightly. Spoon into pie crust and continue as directed.